Challenge yourself to run higher with the XA ELEVATE GTX®. It inspires confidence on smooth or rugged trails, and it has a full GORE-TEX® bootie and premium wet traction sole for all-weather adventures. 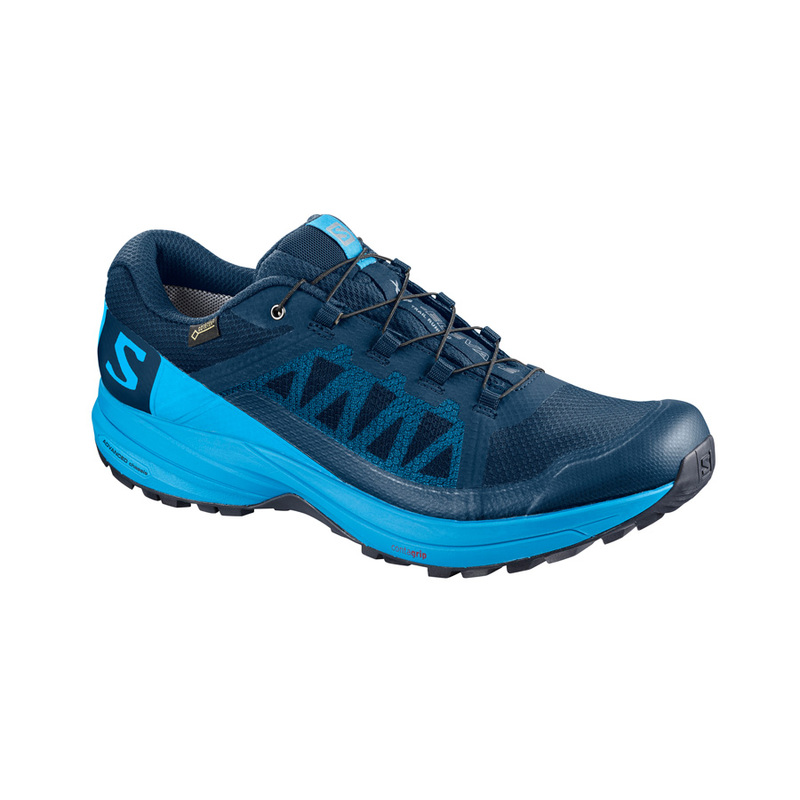 The upper of the Salomon XA Elevate is constructed with a durable waterproof GORE-TEX membrane providing greater flex, better cushion and less weight. The GORE-TEX membrane is an extremely thin layer of expanded polytetrafluoroethylene (ePTFE). It has over 9 billion pores per square inch and it's these pores that give the GORE-TEX fabric its characteristics. Wet fabrics rob your body of warmth. This waterproof membrane allows you to stay dry whilst allowing air to permeate, ensuring you keep comfortable on long runs. 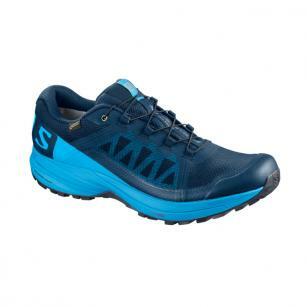 Additionally, the trail running shoes feature an open mesh which offers ventilation to the feet, keeping them feeling cool and dry throughout a run. A sensifit system works to cradle the foot providing a precise and secure fit, working with the Quicklace system. The Quicklace system is a minimalistic and strong lace for one-pull tightening for easy on and off. Lastly, the friction free lace eyelets also ensure a quick and easy one pull lacing system but eliminates the chances of any chafing or discomfort. EnergyCell+ is a high-rebound while also delivering substantial cushioning and durability. This midsole compound works with a Dual Density EVA which provides superior cushioning, stability and motion control. These two technologies combined with the advanced chassis that is placed between the outsole and midsole, maximises motion control, energy management and push through protection offer an efficient, stable and responsive ride. The XA Elevate utilises Salomon's latest Premium Wet Traction Contragrip rubber compound. The lugs are highly separated to help facilitate responsiveness, grip, and allows for a more efficient mud and snow release. The Premium Wet Traction rubber is more than a technology, it's a mentality. You can simply ignore slippery terrain and charge ahead. EnergyCell+ - Provides exceptional energy return while also delivering substantial cushioning and durability. Dual Density EVA - Offers soft cushioning and durability where you need it most.